To savor life some suggest the exercise to write your own obituary. As if preparing for death highlights what is important in the present and what survives. When Jack Marinsky and Larry Glendenin discovered element 61, a rare earth, in the reactor at Oak Ridge in the spring of 1945, they approached my mother to name it. She invoked Prometheus, saying, “Like Prometheus, you have stolen fire from the gods and mankind may suffer for it.” Thence the name, Promethium. Prometheus’ punishment was to be chained to a rock and to suffer daily attacks of an eagle eating his liver. From his daring, humankind benefitted. Taming fire enabled survival in cold places and developments in agriculture, gender roles, and cooking. 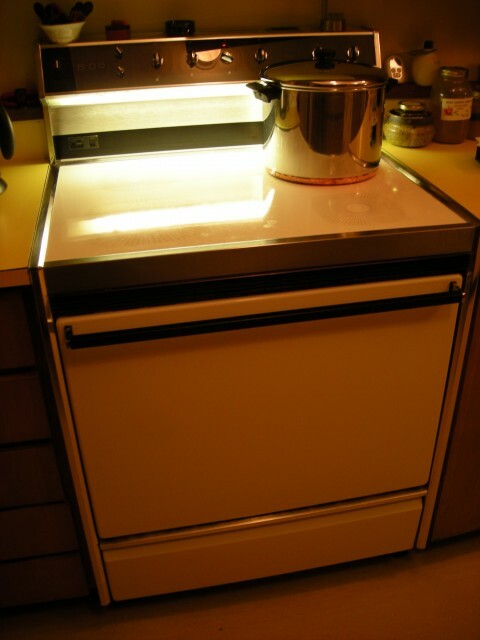 Newly pregnant with our firstborn child, we bought the cooking appliance in January of 1975, in order to stop squabbling about who would clean the tricky spiral coils and readily burnt saucers of the original electric stove in our kitchen. The salesman glowed about the toughness of the heat-strengthened ceramic surface and and did not refuse Seelye’s test to drop his bonafide Swiss Army knife from as high as he could reach above the demo model. He did. No chip, no crack. Moreover, the self-cleaning oven proved well-insulated, with a see-through window and light to illumine the capacious interior. The smooth glossy white surface sold us. To clean: simply wipe it with a paper towel and Bon Ami or Corning cleaner whose oxalic acid component does not scratch the ceramic. Occasionally use a single-sided razor blade to scrape burnt deposits. The top can hold a liter of spilled fluid, too. When cool, it serves as a counter, making space in a two-fanny kitchen for unloading groceries, rolling out pie crust or kneading bread. Bright lights indicate when the burners or “tempassure” units, are at the designated degrees Farenheit; when cooling, HOT; or when completely cool, OFF. The clock with digital display, accomplished by rolling plates clicking in place to form the numbers, controls the self cleaning, timed baking, and a plug-in outlet for other appliances like a coffee maker or crock pot. With age the mechanism turning the plates has worn. We are now using the third replacement clock. Since the price of that idiosyncratic part has risen like college tuition we use exterior timers and set the clock after power outages or seasonal changes, by throwing the coupled circuit breakers downstairs in the basement. This requires complicated arithmetic. We console each other that the aging of the cooking appliance delays our own by requiring mental agility to calculate to the minute the correct time! Thanks to the Babylonians for base 60 math. A key feature of this modern hearth is that three of the four circular heating elements contain at their center a ring with imbedded thermistors.These insure that the the temperature on the bottom of the flat pot matches that selected on the dial. Because these “tempassure” circles require direct, full contact, a warped, footed, or charred pan will not heat well. Properly employed and cleaned for optimum heat transfer these units allow dependable simmering and no boiling over. The fourth circle, larger of the two sizes, functions like a regular electric coil, pumping out heat on low, hotter and high settings. It takes a long time to cool. The designers of this post-Sputnik stove, however, failed to plan for cooking stir-fries in the ancient spun-steel round-bottom wok. Slower to come to breathe, woks work, but not like over a hot gas fire. But then, new pilotless gas stoves cannot hold a low simmer like this one. I love this stove. I love the man who bought it with me and shares the care, cooking, and cleaning of it. It makes for joy to think of all the meals, parties, soups for the well and sick, bread, pumpkins, turkeys, roasts, play dough sculptures, cookies, science experiments that have changed phase in its embrace. I delight in the calculations for timed bake, timed self-clean, and resets for power lapses and seasonal time change. Fall back, spring ahead. 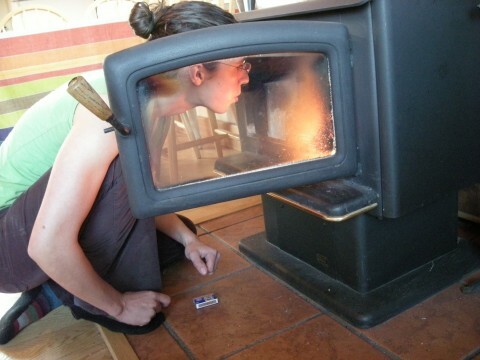 Hearth-tender, She Kept the Stove Top Clean.